Right about now, you might be wondering if I’ve finally lost it. Caelin, really? What’s next? Madisynne? Aydhin? Not so. Caelin has a legitimate history of use, as both a masculine and feminine moniker. 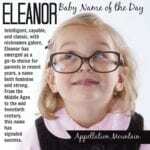 Emmy Jo gets a gold star for unearthing the most obscure Name of the Day yet – the masculine Caelin. First let’s get the female Caelin out of the way. Saint Caellainn, Caolainn, Caoilfionn or Caoilfhionn lived in the sixth century. Little is known of her life, but a church named after her stands in Roscommon, Ireland. When her name is Anglicized, it usually becomes Keelin or Keelan – which, in turn, is sometimes heard as a surname. The male Caelins – two of them – appear in the Venerable Bede’s Ecclesiastical History of the English People. Saint Bede lived – and wrote – at the turn of the eighth century. While some histories from the era are little more than a collection of popular tales, Bede was part of the monastery at Wearmouth, the rare place where he’d have access to a wealth of written records from times past. Plenty of his points are open to debate, but it’s largely a factual account. The first Caelin was a priest, and brother to three other priests – Ceadda, Cedd and Cynibil. Cedd set off to evangelize the Mercians and became a bishop and a saint. Ceadda – commonly Anglicized as Chad – became a bishop and a saint, too. The quartet were well born, educated and apparently supported each others’ efforts, both spiritually and in practical matters. The second Caelin is also called Ceawlin. Or Ceaulin. In any case, he was King of Wessex and successful at expanding his holdings through the late 500s. His reign may have ended in civil war – it’s not clear. His name is sometimes Anglicized as Coelin. Caillin was a seventh century bishop known for taking on Druids and spending time with Saint Aidan; he became a saint himself. Speaking of Aidan, like Ronan and many other Gaelic monikers, the name Caolán is used sparingly. It’s a combination of caol – slender – and the suffix án, meaning “little one.” Caoilfionn is the feminine version. At least one modern notable wears a version of the name. Viscount Weymouth was named Ceawlin Henry Laszlo Thynn after the medieval ruler. What seems most likely is that Caol, Cail and Ceal were popular sounds in names for a few centuries in the Early Middle Ages. There’s an almost mind-boggling list of names that could be related. But does any of it matter? Kaylin ranked #376 for girls born in the US in 2007. Kaylynn was #599, Kaylyn #642 and Kaylen #849. She’s a logical extension of the Kayla/Mikayla/Kaylee/Kayden/Kaydence trend in recent years. A few baby names sites link Kaylin and Caoilfhionn, despite the pronunciation issue. Name a son Caelin, and regardless of his roots in English history, odds are that he’ll grow up feeling that he has a girl’s name – and a creatively spelled one at that! The best bet to preserve this unusual choice might be to stick with the Ceawlin spelling and say it KEEL on or KEEL in. But I’ll admit, I’m divided on Caelin and humbly hand this one over to the readers. Would Caelin strike you as an appealing medieval revival pick, or is he too close to trendy girls’ appellations to wear well on a boy? I just found this site doing a google search on Sts. Caolan or Caellainn. My husband wants the name Kellan/Kelan/Kellen (not sure on the spelling yet) for a boy. We are Catholic and a patron saint to go with our names is a must. A couple of Catholic baby name books have given me “St. Callan” as a namesake for Kellan and I can’t find a thing about him ANYWHERE. Anyhow, I was wondering if someone could give me a phonetic pronunciation of the above names. Are they close enough sounding to Kellan to use as a patron…or does anyone know anything about the mysterious St. Callan? Thank you! I’m actually a female Cailin (pronounced the same as the above names). The spelling looks more like the Irish word for girl ‘cailín’ (which is pronounced Colleen). I actually wanted to change the spelling of my name to Caoilfhionn (I’m told in some regions of Ireland these names are pronounced like Caelin) so it would be more ‘authentic’ but I got too many thumbs down. And to be fair, it would probably complicate things. I much prefer Caelia for a girl than Caelin. It has the ultra feminine -lia at the end so there is no gender confusion. My name is Caelin, too. I’ve never met a sing person with the spelling, either. I am female, and I feel like I am the only female! It’s nice knowing someone else has the same name, because I thought it was weird since I never met anyone else. my son, caelin, hates his name. i think it’s cool. i ‘ve always loved it. he’s a strong athletic kid who goes by his last name when playing any sport. guess my opinion doesn’t reallt mattee huh? this coming from a person who named her son caelin and daughter ryan. go figure. I have a son named Caelin who is 7 years old. I happen to love the name and do not think that it is girly at all. I do know girls who are named Kaylynn, but none spelled like my son’s name. Thanks for the comment, Shay. The longer I really look at the phenomenon of gender-crossing names, the more I’m convinced that it really is a non-issue. We call our firstborn Aly, and it doesn’t make him any less of a stinky-footed, basketball-playing, Monster-Jam-loving boy! My son is Caelin. I love it. It suits him and I just hope people wont be so moronic when he is older to think it is a girly name when in history it is a male name. As said above girls are often K’s and boys are often C’s. My son is Caelin too, and he was born in 2009. I love the name and it is historically a boys name, and I even met another mother who had it on the list for her son. I get many good comments on his name, the only bad ones were from idiots in the family who say any “lynn” sounding name should only be given to a girl. And from an old lady who was about 500 years old and had a hairy chin. I think the name suits him and the meaning does too. H’okay … not sure you’ve convinced any parents to embrace Caelin for their sons, but kudos for trying. Alright– For one thing, as obviously stated, my name is indeed Caelin. And due to certain above responses, I am currently enraged. I personally think Caelin is the best name ever — and definitely not girly. I think it definitely gives an “F off, my name is Caelin” vibe rather than a girly vibe. When I first started school, I loathed my parent’s choice in naming me. But now I’ve come to see the uniqueness in my name — but I also see it’s downfalls. Whenever a substitute teacher calls roll, she always looks in the girls’ section, and when I raise my hand, she raises her eyebrows and says, “OOH.” When I grow up, I may name my son Caelin, too, just so he knows what I’m going through. I will never have a perky, news-anchor name like Katie Couric or Anderson Cooper. Nor will it be a cool movie star name like Chun Yow Fat or Patrick Swayze. It will always make me sound like a young boy. For example, perhaps one day I will be on the news as a witness of a recent crime. The reporter would say, “Now here’s Caelin Amin who witnessed these events . . .Caelin?” You would expect to see a child with such a giddy, young-sounding name. But I would enter, a man with a full mustache, beard and unibrow, my long flowing curls braided into Viking braids, my filthy, manly stench able to knock out an impeccably groomed Fareed Zacharia. And I would just say, “What? Why are you staring like that?” Proud, with that fantastic name. I too, assumed it was KAY-lin. I like Callum better than Caelin. The sound of Caelin is fairly cool, I must say. But, like Cat, I can’t really get past the whole tryndee sounding thing?! KAY-len ruins it for me. The gender issue is not much of a problem though, really. Here in Australia, Cailin/Caelon is used widely as both a boys and a girls name. Most girls have it spelt with a K, whilst the boys are most usually adorned with the C version. This is so strange, but this name has now popped up on a naming board just the day you posted. Made the Twilight Zone music go off in my head since I’d never heard it before! Shannon — According to Old English pronunciation rules, I believe Caelin should be pronounced KAL-in, like Calvin without the V. The “ae” in Old English is pronounced as a short A sound. I like it, but pronunciation confusion/gender confusion and the assumption that I liked Kaylin but wanted to spell it more kreatively would probably stop me from using it… the real pronunciation is Keelin? Right – what Emmy Jo said. Think Calvin without the v.
The feminine name worn by the saint (usually) becomes Keelin, except that it doesn’t. And it is complicated by accents from one side of the Atlantic to the other. I know, I suppose many people would think that, but I grew up with a boy called Damien (or Damian, I’m not too sure) and he turned out to be the ultimate good guy! Thanks again for doing them! Emmy Jo, I think that’s an excellent point – Caelin might just satisfy when one parent is craving history and the other wants something current! And you’re right about Callum/Collin. I met a (male) Kellon the other day, and I was reminded how many parents have tried to find something similar to Caelin through the years. Emma, Damien will be NotD on April 1. But I must say, the Omen association is quite a lot to overcome! Caelin is very usable, but just seems so tryndy. I can’t like it because of that, really. Thanks, Verity, for featuring this one! I love Caelin. He’s not on my list of names to actually use, but he’s on my list to admire. I see Caelin as very usable, as long as you don’t mind the pronunciation difficulty. Yes, he looks like a modern, respelled name, but a lot of people are choosing those names, so he won’t seem out of place. He’s almost a cross between Collin and Callum, isn’t he? This could potentially be a good compromise name — when the mom likes Caden and Jalen but the dad likes Octavius and Benedict, Caelin incorporates some elements of both. Hmm. I’m intrigued by Caelin, I really am. Though I’m hesitant about putting him in front, like Lola, I’d be much more open to sticking him in the middle. 1) Pronunciation- In the US, thanks to the girls’ name of similar spelling, it’ll be pronounced KAY-lynn. No thanks. 2) The spelling itself. I know it’s a perfectly legitimate one, but it’s rather akin to me to naming a little girl Brighid, rather than Bridget. While it’s perfectly legitimate, most people will think you’ve gone with a “creative” spelling. I’d be much more likely to spell it phonetically, as in Callan, though ironically that’s the feminine and therefore the *actual* “creative” spelling. I do think he’s interesting (spelled either way), and I’d love to see more of him in the future! Sorry, but I must admit even after you have explained his history and usage, I still shudder at the spelling. I would hate anyone to assume I had kreatively named my child! I have more requests for NOTD, if that’s all right? I discovered you don’t have much in the way of D names for boys on your ‘Boy’s Names’ page, so I am taking it upon myself to suggest Damien. I know, I know; little demon boy from The Omen. Still, I am wondering whether an adorable little boy could pull this one off? Again, thank you for considering Dilys and I look forward to it greatly! For me and my instinctual Yankee pronunciation, Caelin’s too girly. But I do like him. I’d just put him in the middle. Easier to enforce Kal-lin there than up front. But he is appealing. Maybe not so uch right now with that K sound everywhere, but it is starting to die a bit, so in a few years, I think he’d be quite a breath of fresh air. Pretty cool Caelin!